Likening skaters to birds? Well, they do defy gravity and achieve incredible, yet gracious, acrobatics mid air, so, OK, I'll buy that. 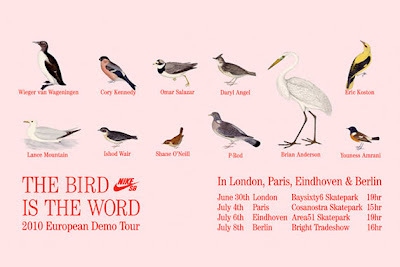 Nike SB has a 2010 skateboarding demo tour on the go. Today they're in Eindhoven, at the Area 51 Skatepark. Nike SB will have some of their star pro-skaters showing what they're made of such as Eric Koston, Lance Mountain, P-Rod, Omar Salzar, Daryl Angel and Cory Kennedy. 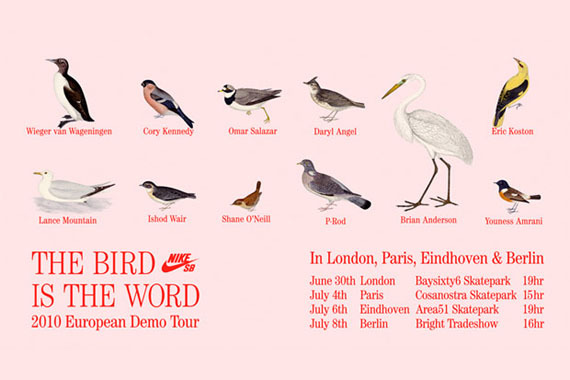 There are 11 Nike por-skaters on the tour, taking in four cities: London, Paris, Eindhoven and Berlin, offering a unique experince to catch a glimps of the pros live. Nice.